“From Disgrace to Dignity” from Christian Faith Publishing author Reggie Longcrier is a gripping book that tells the story of the author, as a young boy, who grows up in shattered environments that have criminal and gang subculture, and his encounter with the Lord that changes him and his ways. “From Disgrace to Dignity”: an awe-inspiring book on the author’s amazing transformation after getting to know God. 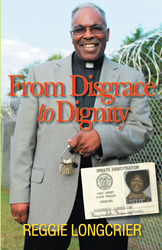 “From Disgrace to Dignity” is the creation of published author, Reggie Longcrier, the chaplain of Catawba Correctional Center in Newton, North Carolina, since 1989. Published by Christian Faith Publishing, Reggie Longcrier’s new book is a touching account of how God can transform anyone—even those who cause great disgrace—from not upholding moral and social ideals to being law-abiding and godly citizens. Longcrier’s life itself is a living testimony of recovery from heroin addiction that had went on for twenty-five years, making him a credible source of success stories like this book. Through his story, he emphasizes that God continues to perform miracles and give breakthroughs in this world. View a synopsis of “From Disgrace to Dignity” on YouTube. Consumers can purchase “From Disgrace to Dignity” at traditional brick & mortar bookstores, or online at Amazon.com, Apple iTunes store, Kobo or Barnes and Noble. For additional information or inquiries about “From Disgrace to Dignity”, contact the Christian Faith Publishing media department at 866-554-0919.